Alternate names for this recipe include Everything-but-the-Kitchen-Sink Pasta Salad or Clean-Out-the-Fridge Pasta Salad. Once you have the basics down, you can use whatever vegetables you have on hand. 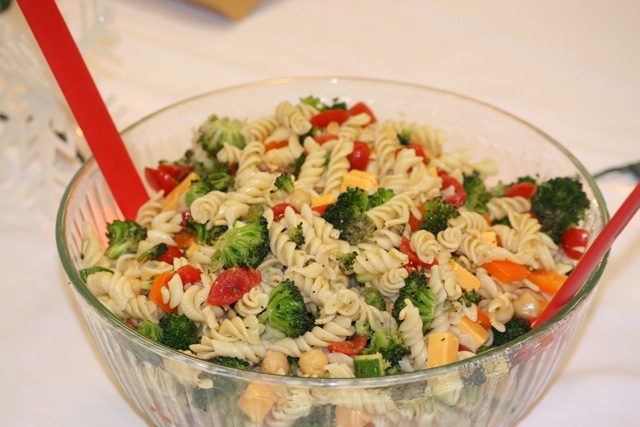 This is great to take to a potluck because it can be made in advance. Also, this is a great dish to make on a Sunday afternoon and eat for lunches throughout the week. You can bulk this up with as many veggies as you want and personalize it to suit your taste. In a large pot of salted water, cook the pasta according to the package directions for al dente. Drain the pasta, toss it with a teaspoon of olive oil, and set it aside to cool. While the pasta cools, prepare the rest of the ingredients. Dice the cheese into small cubes. Cut the cherry tomatoes in half. Wash the broccoli and cut into small florets. Dice the bell pepper and the zucchini. Rinse and drain the chickpeas. Chop the parsley. Combine all ingredients in a large bowl. Chill until ready to serve.